As a child, my father was stationed in Japan. 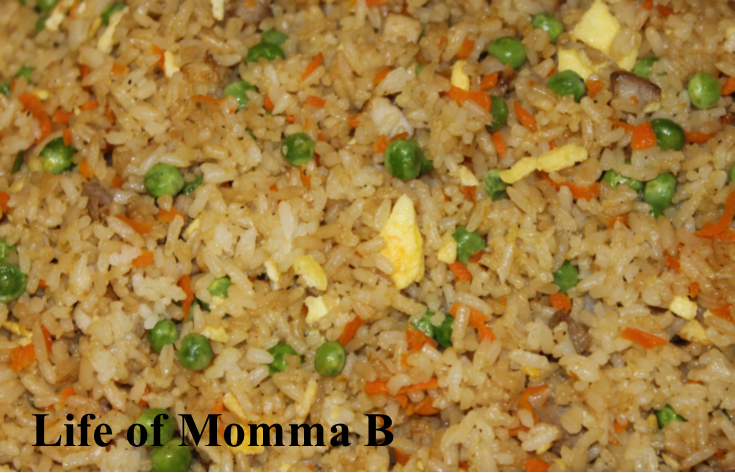 I am not certain if this is where my mother learned to make fried rice, but it was a staple growing up. This is my take on my mother’s recipe. Fried Rice is a rather basic recipe that can easily be changed to accommodate whatever ingredients or left overs you have on hand. It works well with chicken or pork. I also have been known to substitute left-over rotesserie chicken. Rinse and cook rice according to package directions. Fluff with fork and set aside. In a large non-stick skillet (12 inch with 3 inch high sides) scramble eggs. Chop finely as you go. Remove from skillet and set aside. Dice the meat finely (it should be about the pea size). And cook until done in the skillet. If using left over meat, then heat through. Remove from skillet and set aside (in the same bowl as the eggs is fine). In the same dry skillet, add carrots, peas, and garlic. Cook 3-5 minutes, stirring frequently until carrots begin to turn tender and the peas are heated through. Remove from skillet and set aside (in the same bowl as the eggs and meat is fine). Now heat the oil in the skillet until the pan is hot and the oil begins to shimmer. Add the rice and toss frequently. You will want the extra moisture from the rice to evaporate. This will take 3-5 minutes. Next, add the soy sauce, fish sauce and black pepper, and mix thoroughly. Return the eggs, meat and vegetables to the pan. Toss one last time and serve. Tips: If the meat is partially frozen it will be easier to cut. If you are unable to cut it in small pieces, cook it in larger pieces then dice (allow to rest a few minutes before cutting). This entry was posted in Recipes and tagged carrots, chicken, eggs, gluten free, main course, one pot meal, peas, pork, rice. Bookmark the permalink.